*You MUST obtain a voucher at the iVenture Sales and Redemption Centre located at Westminster Pier (Westminster Pier, Victoria Embankment, London SW1A 2JH), please have your iVenture Card present. Collection Information *You MUST obtain a voucher at the iVenture Sales and Redemption Centre located at Westminster Pier (Westminster Pier, Victoria Embankment, London SW1A 2JH), please have your iVenture Card present. The Oyster Card is a plastic smartcard which holds pay-as-you-go credit that gives you round-the-clock access to just about every transport option in London. With unlimited travel on the bus, Underground, train and even river bus networks, the Oyster Card really is the easiest way to travel around London. Whether it’s bus, tube, tram, Docklands Light Railway, or overground train services, the Oyster Card is the single most convenient way to pay for travel and get where you want to with the least amount of hassle. Your card comes already charged with £10 of credit, so you can start travelling straight away. Not only do you get this credit, but you avoid having to pay the £5.00 deposit that TFL charge. When your credit is running low, simply top it up using cash or credit card at any station. 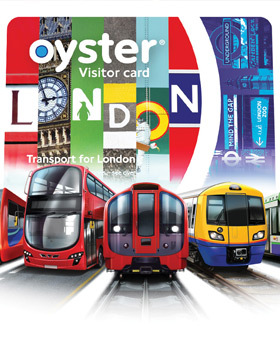 Oyster Cards can be used on all London buses with the red roundel logo, all tube, DLR and Overground services in Zones 1-9, and is also accepted in many National Rail Services beyond Zone 9 (including the Gatwick Express). Your card can even be used for Thames Clipper River Bus services. However, these trips will not count towards daily caps. Once you’ve signed up online for an Oyster account, you get full access to all your journeys, so you can see exactly how much you‘ve spent and when. Any Oyster Cards added to your online account will be automatically protected against loss and theft. If you intend using your Oyster Card a lot over a short period of time, then you’re in luck. All Oysters Cards are subject to capping, which means once your daily fares reach a certain limit, you won’t be charged above that for the 24-hour period between 4:30 am and 4.29 am the following day, regardless of how many journeys you make. Caps vary depending on the form of transport used. The Oyster Card cannot be used for the Heathrow Express or services that begin or terminate outside the pay-as-you-go area, including East Midlands, Virgin and Grand Central Trains.